We’re travelling back in time for this slot machine review. In The Falcon Huntress by Thunderkickwe join a young Native American tribal girl and her trusty feathered friend in search of riches. In terms of looks, the slot is fairly strong. It features tastefully depicted, authentic looking imagery for its symbols and the gameboard design is great to boot. Unfortunately, when it comes to special features, The Falcon Huntress is something of a let-down. It’s much more of a “spin and win” style slot than one with exciting bonus side games throughout. Whilst this will appeal to many players, those seeking the kind of exotic side games common on other slot machines will be sorely disappointed. High main game prizes. They might not be the 10,000x we’ve seen in the past but a Thunderkick game with multiple three figure jackpots is certainly something to shout about. Great look, theme, and sounds. These come together neatly to create a game with a strong feel of its own. Not one for the bonus hunters out there. The game features are kind of entertaining and can be pretty lucrative but there is no real excitement. We’re supposed to be on the Great American Plains here. Some action would be nice! Few options to adjust bet sizes and distributions. This is common on most Thunderkick games, however. Huntress = 500x the total bet. Falcon “wild” = 200x the total bet. Falcon hood = 100x the total bet. Egg = 75x the total bet. Feather = 50x the total bet. The “Wild” symbol on The Falcon Huntress is also a “Scatter” symbol. It substitutes for any other symbol in the game. Landing three or more of the falcon “wild” symbols will trigger the Bonus Game. This is a free spins mode in which players can spin the reels 10 times at no charge. 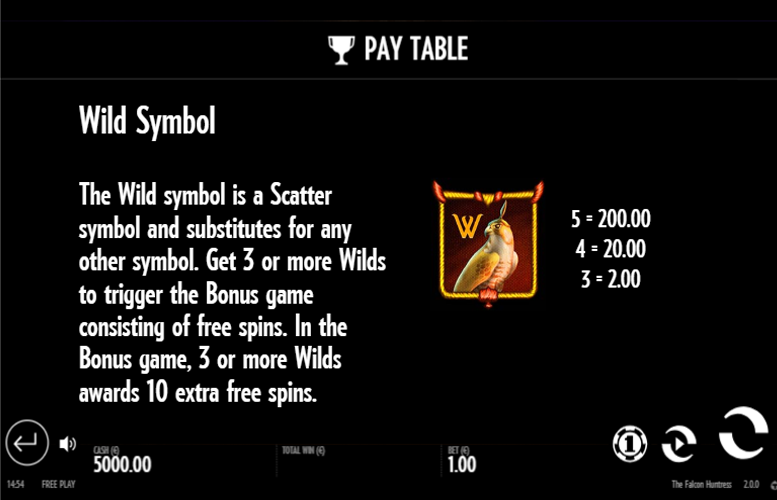 During the Bonus Game, players can trigger 10 additional free spins by landing another three falcon “wilds” on the reels. 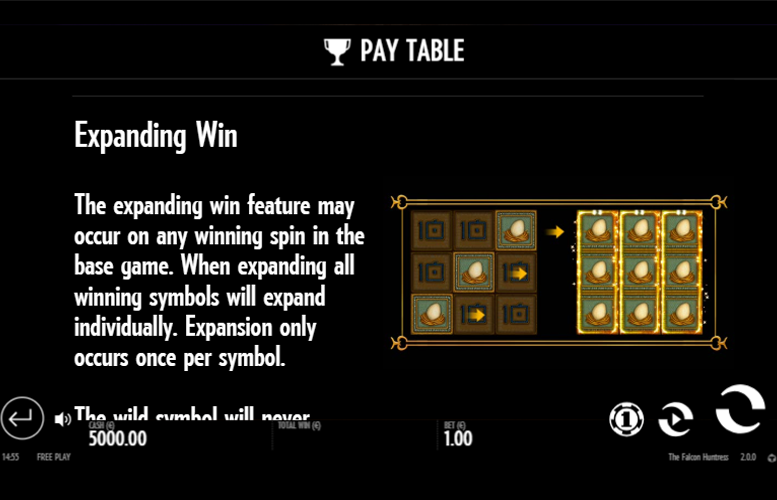 The expanding win feature may occur on any winning spin during the base or bonus game. When expanding all winning symbols will expand individually. Whilst not particularly interactive, this feature can be rather lucrative. Players should note that the “wild” symbol will not expand, and each symbol can only expand once. Ace = 15x the total bet. King = 12.5x the total bet. Queen, Jack, or Ten = 10x the total bet. 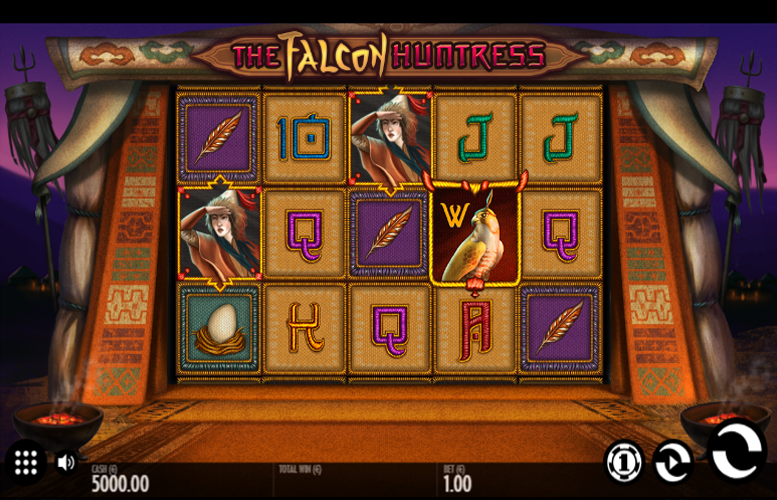 Unlike many slot machines, players do not have many options to distribute their bets on The Falcon Huntress. 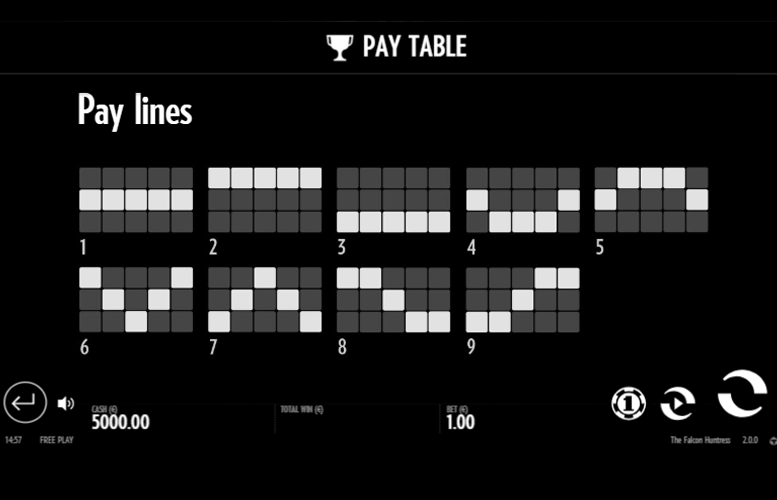 Whereas titles from other developers will often feature different options to vary the number of win lines or the amount bet on each one, on this game players are only given total bet amounts to select from. There are 12 of these in total and their amounts range from just 10p to £100. Evidently, Thunderkick wanted The Falcon Huntress to appeal to as wide an audience as possible when choosing their betting limits. That said, some of the highest rollers around might find the upperfigure a little limiting. First impressions of The Falcon Huntress are strong. 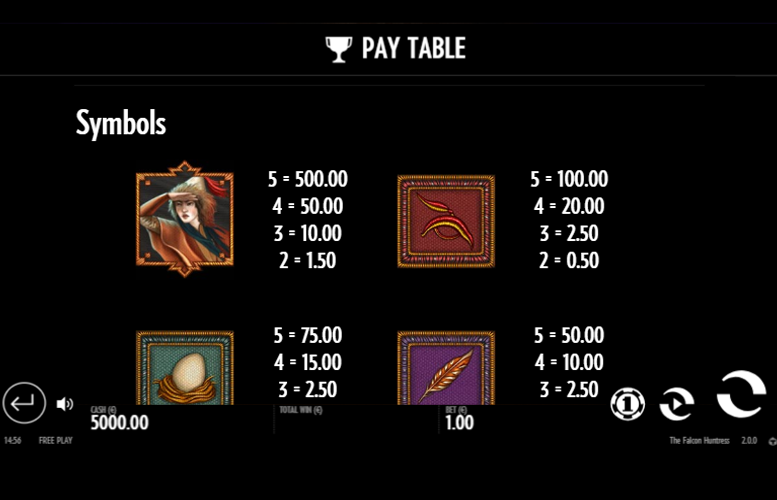 The gameboard looks great and the symbols have been well-designed. The sounds are appropriate too with ethereal, mystic music and whirling winds helping to really set the scene. However, for a slot with such a great theme and intriguing title, The Falcon Huntress is a let-down. It does very little to excite players and those that came expecting to see epic cut screens of falcons in flight or our heroine taking down prey will be sorely disappointed. All that said, there are certainly many players who prefer this top-heavy, no nonsense style of machine. For players of these tastes, The Falcon Huntress might be just right. This game has a rating of 3 / 5 with 541 total reviews by the users.